Hong Kong has grown from a small fishing village to one of the best known metropolitan cities in the world in less then a hundred years. No citizen from Hong Kong should found a construction site a stranger, we all cross path with numbers of urban renewal and repurposing project sites everyday. So what is a construction site to a citizen? It is the origin of noise and air pollution, a site of which we all resist. The city is non-stop developing, new things appear and old things fade away, more and more memories and space are no longer exist. Things keep destroyed no matter they are good or not, lovely buildings, old streets and our childhood playground... We are forced to live in the wave of growth. Inspired by DETOUR 2012’s theme - 'Design Renegade', we hope to comfort the citizens' resistance toward a construction site by creating a relaxing and welcoming public space at Former Wan Chai Police Station. Using construction elements to build the installation, also create a strong theme and mood of the wave of growth. Base on data of construction sites and buildings in Hong Kong, we created a frequency with ever growing cycles. Most of the public space in Hong Kong are occupied by commercialactivities such as shopping malls, people have to consume to use those space. 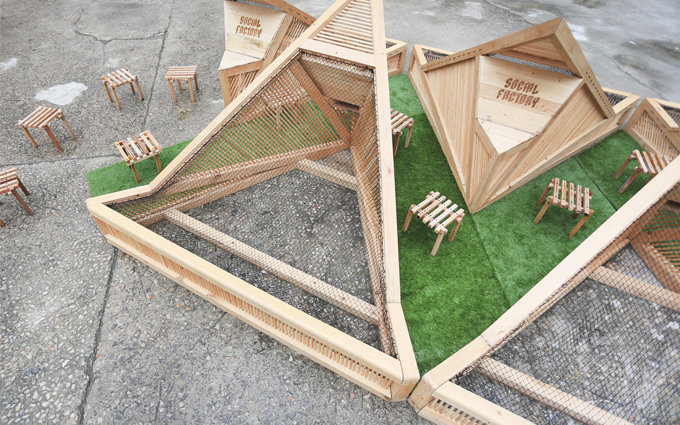 ‘Social Factory’ is a project that allows people to build a ‘Social Stool’ by themselves, to create or defence public space without spending money in Hong Kong during Detour 2012. Buildings are getting bigger and taller, however the space that we could use are getting smaller and lesser, we are losing more and more public space during the development in Hong Kong. Should we stay silent? To protect our public space, we are going hold a workshop for public, the ‘Social Factory’. It’s easy to build the ’Social Stool’ in this workshop, the stool can be used once it’s builded, people no longer have to spend for using public space. Also, the other aim of this project is let the public enjoy and try out the DIY experience in this simple woodcraft workshop. Providing all materials, tools and instructions for participant, let them build a simple stool by their own just using simple tools. To protect public space with public activities. The workshop is open and available for all people, participant can interact with people and public space by making new furniture, also will help for expanding the public space and get people closer.